For more than 12 years, industry professionals in South Florida have turned to Nalboor Tiles for quality construction materials. Our online showroom offers the convenience of viewing accurate representations of our product line from the comfort of your home or office. If you’re looking to carry an affordable floor tile that’s in demand, consider warm, welcoming Crema Marfil marble tiles. What is Crema Marfil Marble? ‘Marfil’ means ivory in Spanish, and it’s an apt descriptor for this mellow, creamy marble with its distinct yet subtle yellow, gold, and reddish veins. This warm, earth-toned tile originates in Novelda, Spain, but it’s now quarried in several locations, including Turkey. Wider availability makes it one of the more affordable select-grade natural stone tiles. There are two main types of Crema Marfil tile and several variations within each that are partially dependent on where the stone is mined; two of the more notable quarries in Spain are at Coto and Zafra. However, the quarry location is less important than the grade of the stone. There can be several grades within the same quarry and grading criteria can vary from one supplier to another, but these are the general guidelines. Crema Marfil Commercial: This is a high-grade variety that’s mostly used in businesses and interior decorating. The main background color is more vibrant and consistent, with slight variations in shade and bolder veining. Crema Marfil Classic: If your customers are looking for a more cost-effective selection that still offers that warm, creamy tone, Classic is a good choice. There’s a greater variation in background color and the veining is not as uniform as the higher grade, so it works best in smaller areas for flooring, in mosaics, or as an accent tile. Why is Crema Marfil Marble a Good Choice for Your Customers? 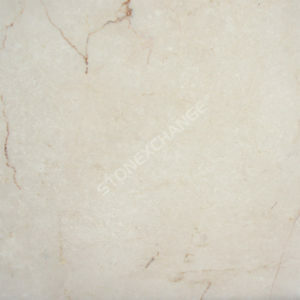 This marble is a favorite of architects and interior designers due to its affordability and neutral tones. The distinctive look of this stone is widely recognized. Its lighter color with striking dark veins open up smaller spaces and lend warmth to large rooms. Our stock is highly polished to give your customers flooring with a mirror-like gleam that enhances commercial and residential spaces alike. The earthy Mediterranean tones glow on sunny days and bring coziness to any interior environment. With proper care, Crema Marfil tile stands up to wear and has a life cycle of 50 – 80 years. In addition to flooring, Cream Marfil is an aesthetically pleasing option for walls, backsplashes, and decorative art. Marble tiles are rated in four categories: abrasion resistance, absorption, acid sensitivity, and freeze-thaw. On the Mohs scale, Crema Marfil rates 1 – 3, meaning minor scratching will occur over time when exposed to abrasive materials like sand or coarse cleaning agents. It will also lose some of its luster over time, so cutting boards and floor mats are appropriate for protection. Oils and substances with high coloration will seep in and cause staining if not addressed immediately. However, minor spills won’t affect tiles that have been properly sealed; re-sealing should be done every couple of years or in case of damage. This means that Crema Marfil tiles can be damaged by acid etching as well as exposure to acidic foods. This makes it an unappealing option for countertops. Freeze-thaw: Incompatible. Due to the structural nature of this type of marble stone, it isn’t a good choice for exterior flooring, wall tiles, or decorative accents. Your business reputation relies on three things: reliability, price, and service. When you deal with an established company like Nalboor Tiles, you’re working with a local supplier that manufactures and imports all of their own stock. This gives you a huge advantage over retail since natural stone has such wide variations in character. That also means you have quality control built-in at the source, which leads to a higher caliber of materials at more competitive prices. Our clients are South Florida business owners just like you. We work with building supply vendors, architects and designers, and construction firms throughout Dade County who need a dependable supply of tiles for high-volume purchases. You’ll also enjoy warehouse-to-warehouse delivery or pick up from our facility. If you need an order above 5,000 square feet please, contact us for a direct quote. We manufacture and import tiles from around the world and pass the savings on to you. Not only do we carry a large selection of natural stone tiles at discount prices, we also offer flexibility, convenience, and peace of mind. Our discounted order requirements range from one crate to several tons of merchandise along with fast and secure delivery that’s available at the click of a button. The only requirement for delivery is a warehouse or other storage facility with a loading dock that’s accessible to our delivery vehicle. You also have the option of picking up your order at our location. Our main goal is to offer you superior products at the lowest prices in town. How confident are we about our products and services? We trust your judgment, so we’ll put our reputation on the line by letting you try before you buy. Request your free sample of Crema Marfil marble tile today. We also make it fast and easy to place an order through our convenient online portal. You can speak to a Nalboor Tiles representative about your inventory requirements or get a quote by sending us a message here. You can also call us at 305-501-4548. We’re standing by to address your questions.